“Kim’s Convenience” had its debut performance at the Bathurst St. Theatre in Toronto during the 2011 Toronto Fringe Festival. 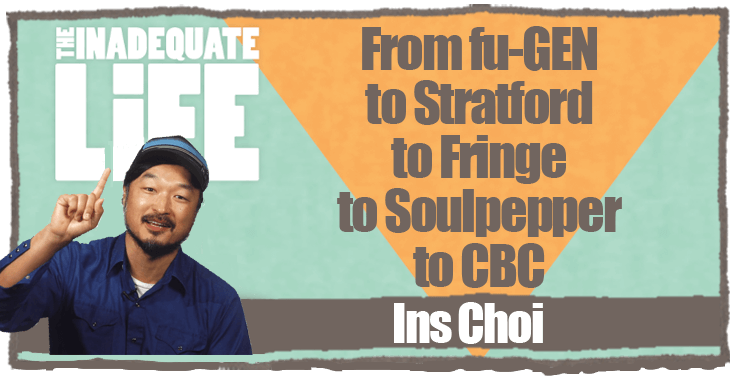 As a former Fringe Festival performer myself, the fact that “Kim’s Convenience” has gone on to such great success is inspiring, and I really hope that this interview will inspire you too. “Kim’s Convenience” follows in the footsteps of Fringe shows including “Life After,” “Da Kink in My Hair,” “Machomer,” “The Drowsy Chaperone” and others that have gone onto great things. We talk about the time in his life when Ins gave up a job with security, benefits and a housing allowance, everything that would have set him up for a traditional life, but it wasn’t a job in the Arts which Ins knew he needed to truly enjoy life. We also talk about his time onstage, acting at The Stratford Festival and his time backstage where he wrote Kim’s Convenience. If you’re a regular listener to the podcast you know I have a 10 year old son and I’m always curious about how family influences the creative voice, so Ins and I start out by talking about his Father who was a pastor and the impact that had on Ins when he was young. Check out episodes that also mention Comedy, Fringe, Soulpepper, Stratford, Writing.